Ships Today if ordered within 1 hrs and 1 min. 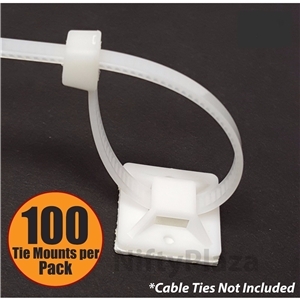 Package Includes: 100 Pieces Cable Ties Mount. More Use: Securing Cable and Cable Bundles to a Surface. Double-sided Sponge Rubber at Back Strong Insulation. With Self Adhesive Cable Tie Mount Base is very easy to fix on the smooth surface. Just peel the covering off of the adhesive backing & stick the mount to the mounting surface. Securely mounted without damaging the mounting surface.